Try Natural, Organic, and Blue Eggs Today! What do you use eggs for? Lately, I have learned how important it is to use organic and cage-free eggs no matter what you are making with eggs! Sometimes, I find it really hard to find them in stores by us so I was really happy to learn about Pete & Gerry's Organic and Heirloom Eggs! They truly care about their chickens and the eggs they produce and sell and I truly appreciate that! Pete and Gerry's is a real family farm. They've produced high-quality eggs for four generations in the heart of New Hampshire's White Mountains. 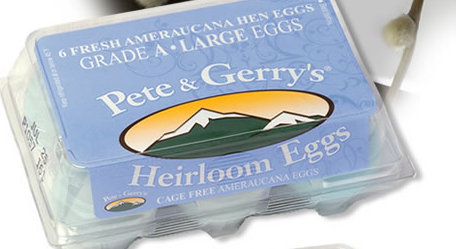 They're committed to producing fresh, organic, cage-free, Omega-3 eggs from hens that are Certified Humane. One of the coolest things about the eggs they offer is that they offer naturally BLUE heirloom eggs that come from Heirloom Ameraucana and Marans breeds. These eggs have deep yellow, richly flavored yolks. The hens are fed a nutritious diet of whole cereal grains, marigold and alfalfa grasses. This all-natural feed contains no by-products, hormones or antibiotics. I have never heard of or seen Blue chicken eggs before (except the artificially colored eggs at Easter) so my family really enjoyed seeing these and eating them! They fit in perfectly for our 4th of July celebrations and they are great for any recipe all year round! Make sure you are feeding your family organic and cage-free eggs for every recipe you make - they are packed with essential vitamins, minerals and proteins. They come from hens fed only organic grain—free from antibiotics, medications, pesticides and herbicides. Buy It: You can purchase Pete & Gerry's Heirloom and Organic Eggs in many other small independent stores and health food stores.